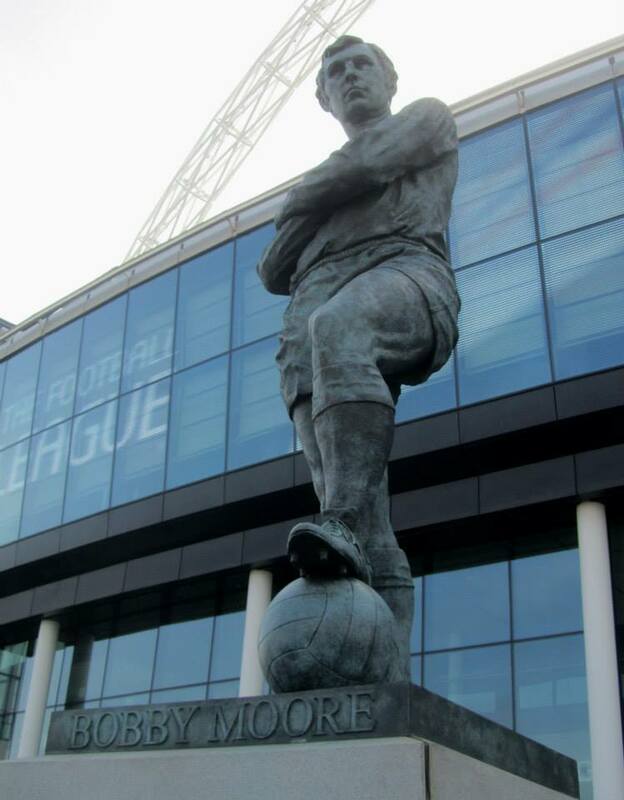 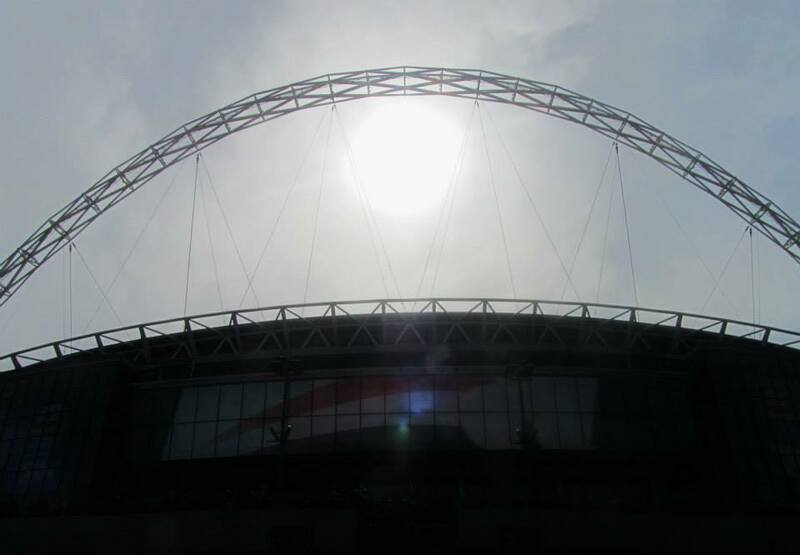 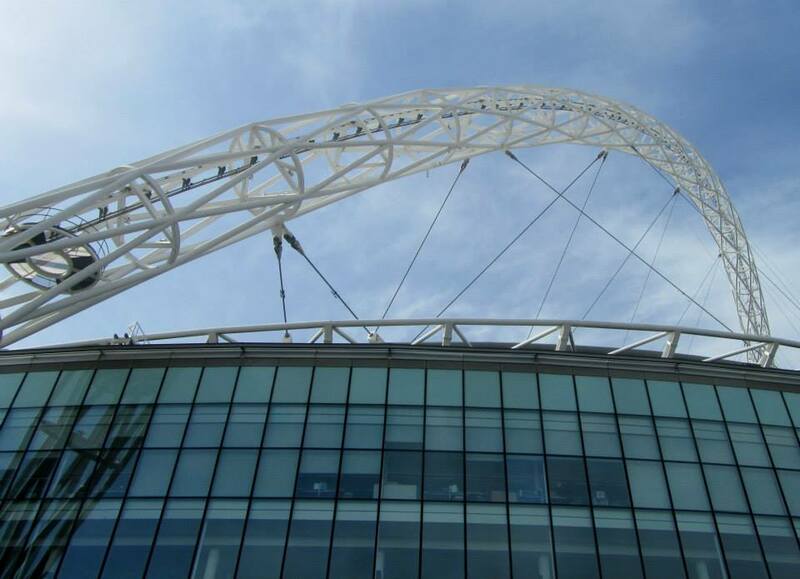 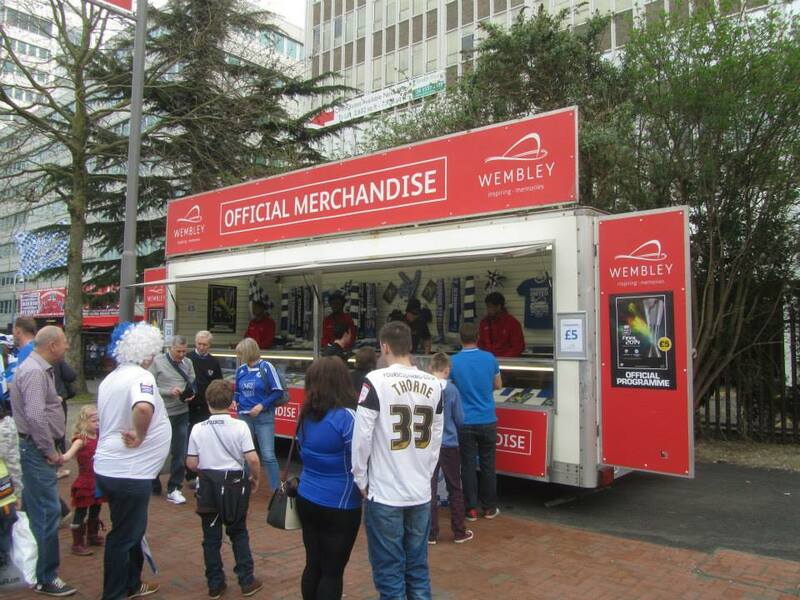 Wembley Stadium is the home of English football. 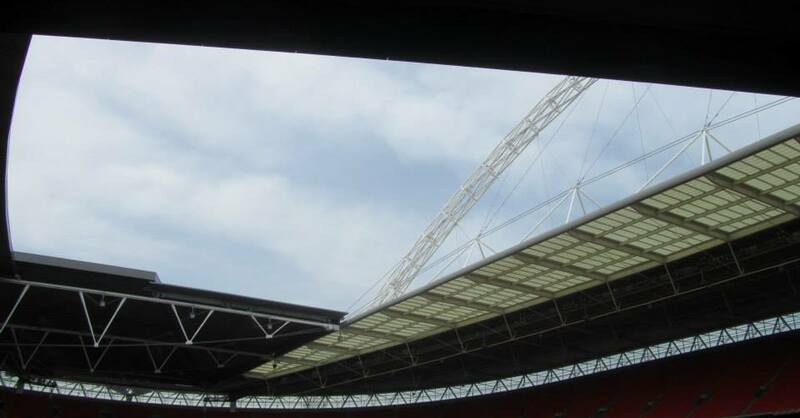 Fans of every club, no matter what their level, dream of seeing their team perform at this great place and for many it can be a once in a lifetime opportunity to do so. 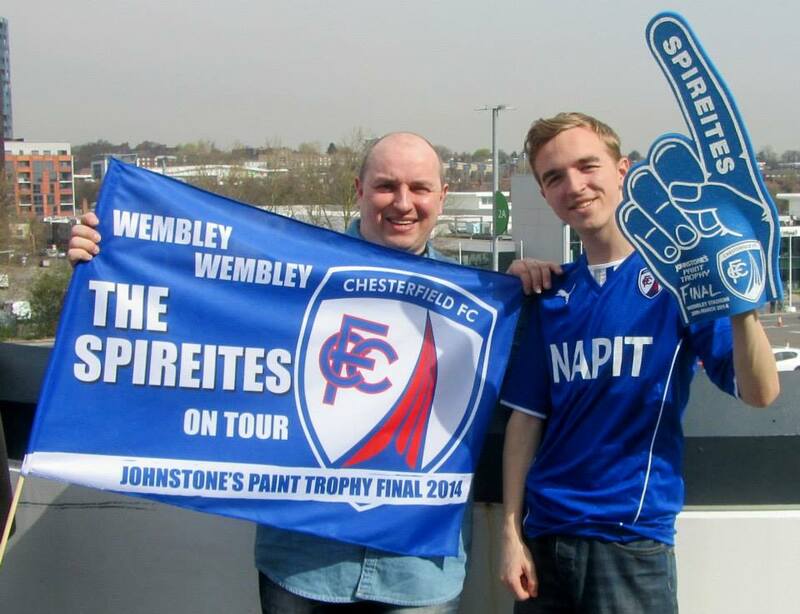 This afternoons visit to the national stadium meant Chesterfield supporters have been lucky enough to see their side play here twice in three years! 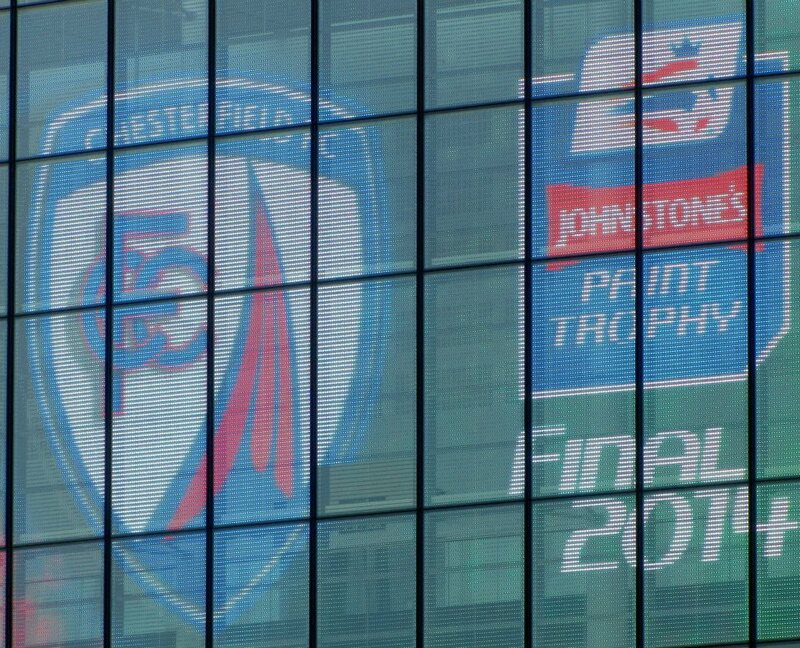 Both visits have come in the Johnstone’s Paint Trophy, a competition that many clubs fail to take particularly seriously but what is, in my opinion, a fantastic opportunity for lower league sides to get a fantastic day out and maybe even win a trophy. 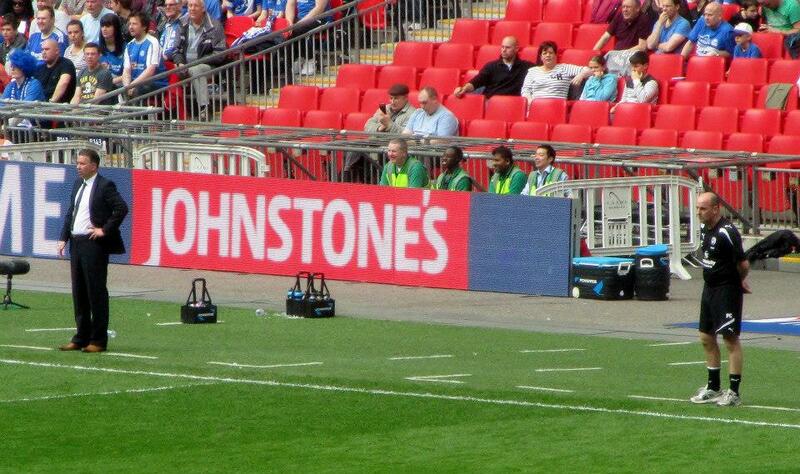 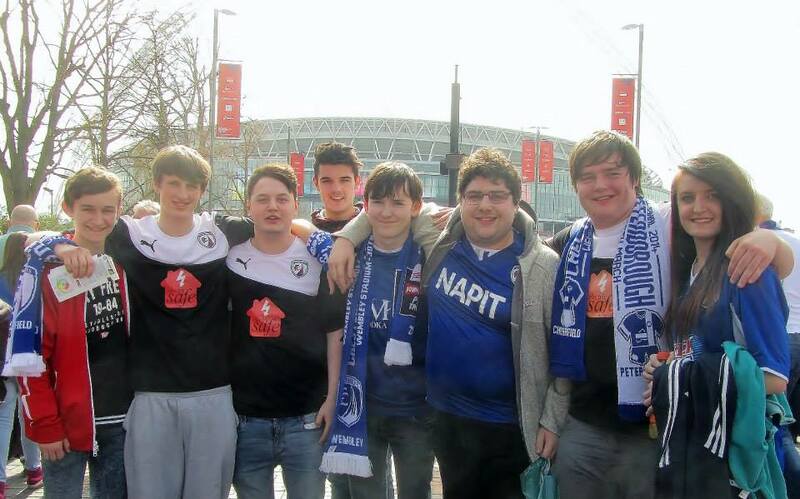 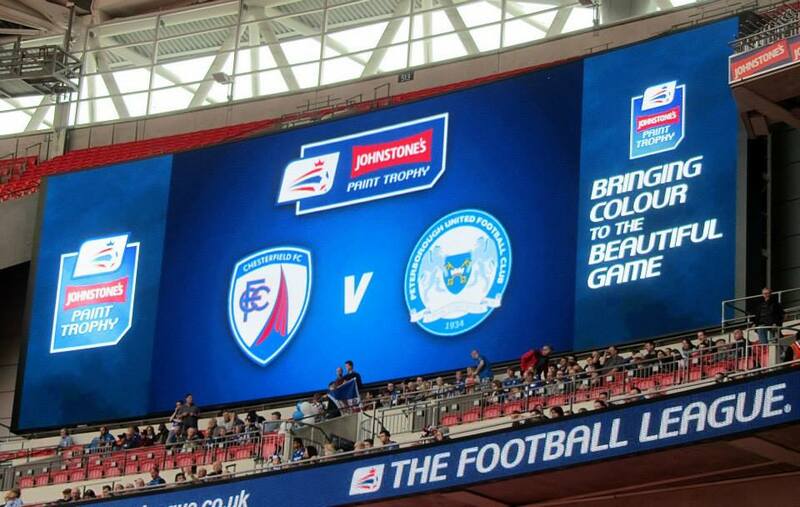 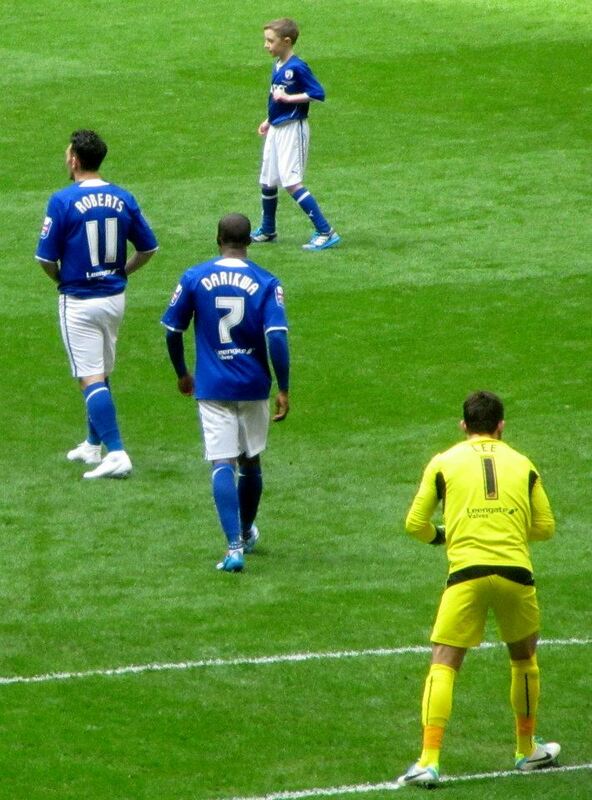 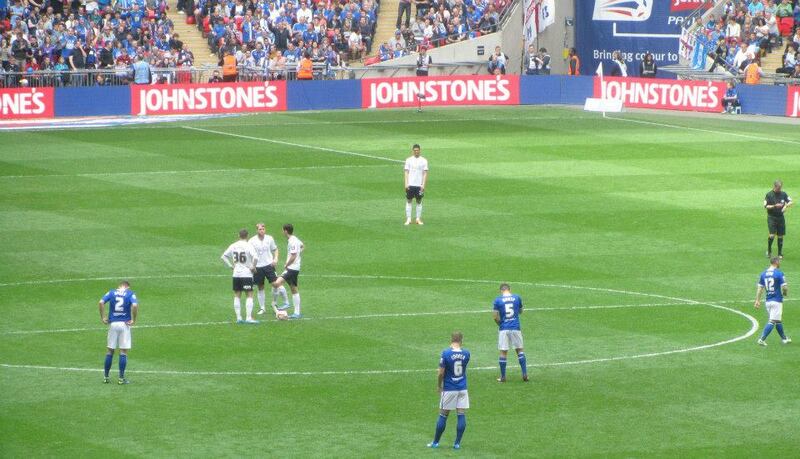 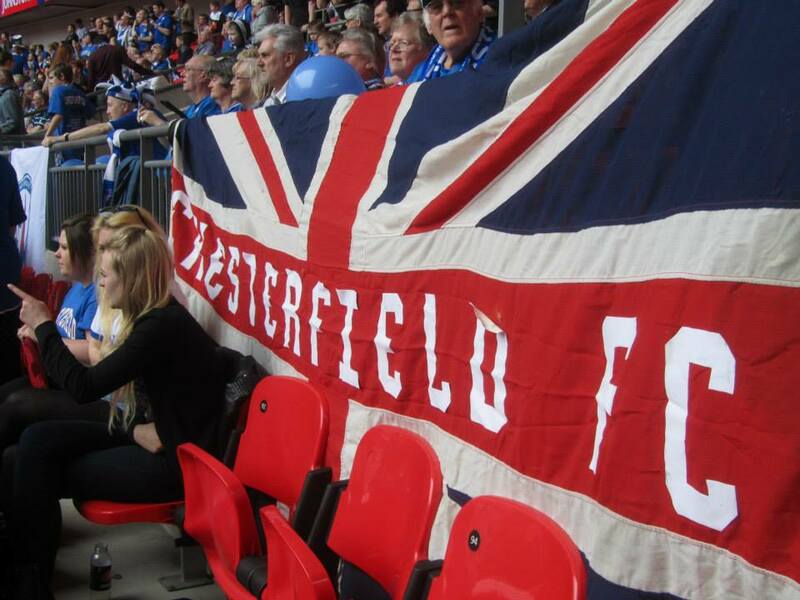 2012 saw Chesterfield win the JPT with a 2-0 victory over Swindon Town. 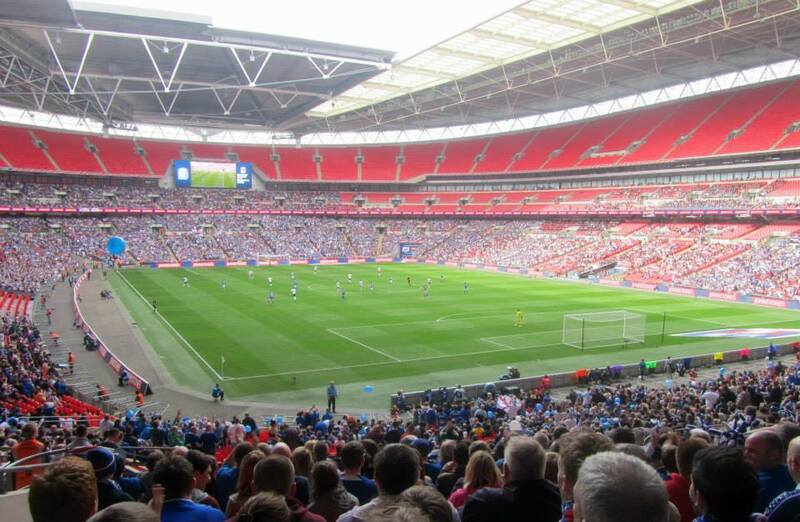 Two years on, the Spireites had booked a return to the final with victories over Mansfield, Rochdale and Oldham before a two-legged victory over Fleetwood Town in the Northern Area final. 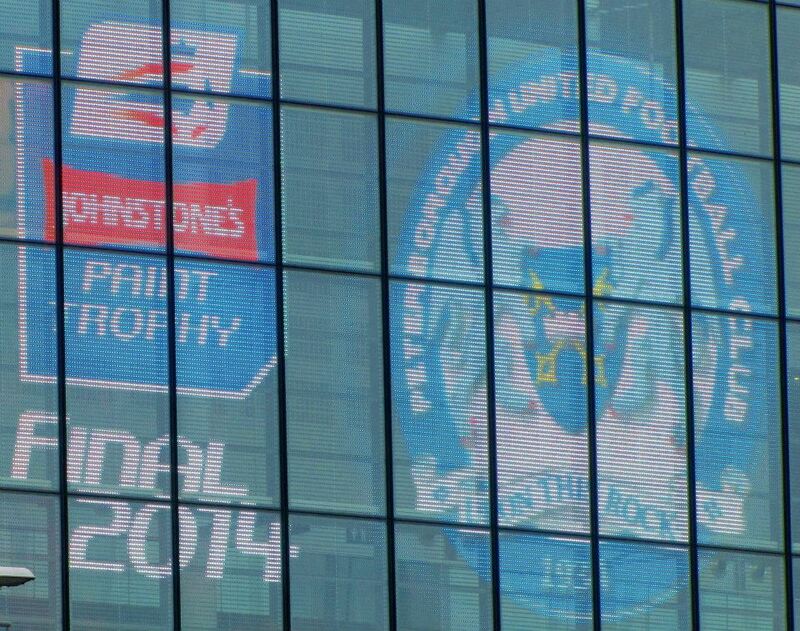 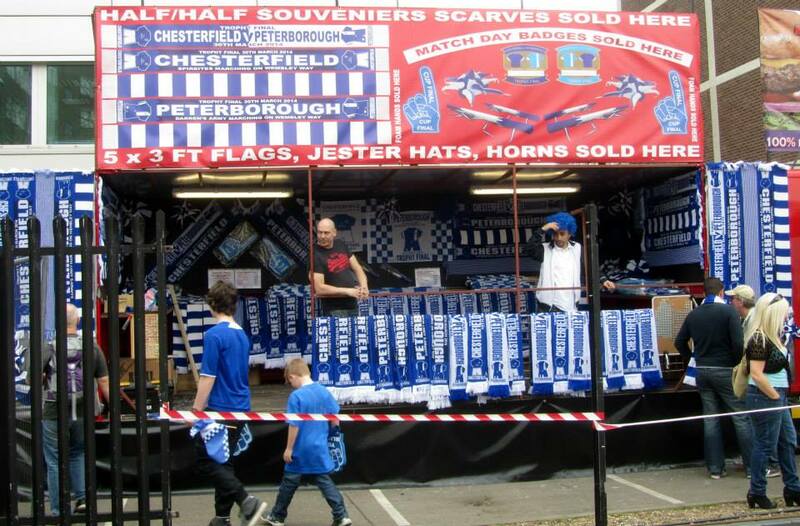 This time the opponents were League 1’s Peterborough United, who had defeated Swindon in the Southern final to deny a repeat of Chesterfield’s previous final two years earlier. 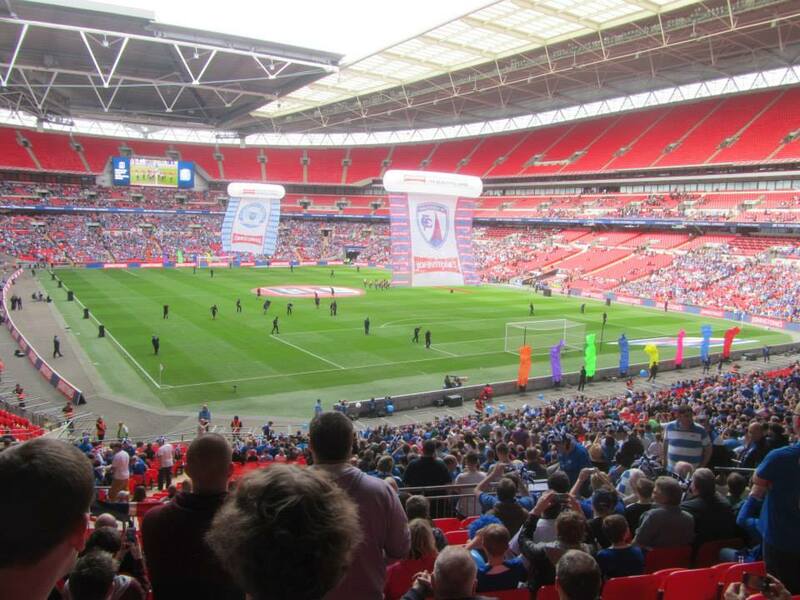 Posh were very much the favourites coming in to the contest, sitting in the League 1 play offs and searching for their first ever piece of major silverware since 1974. 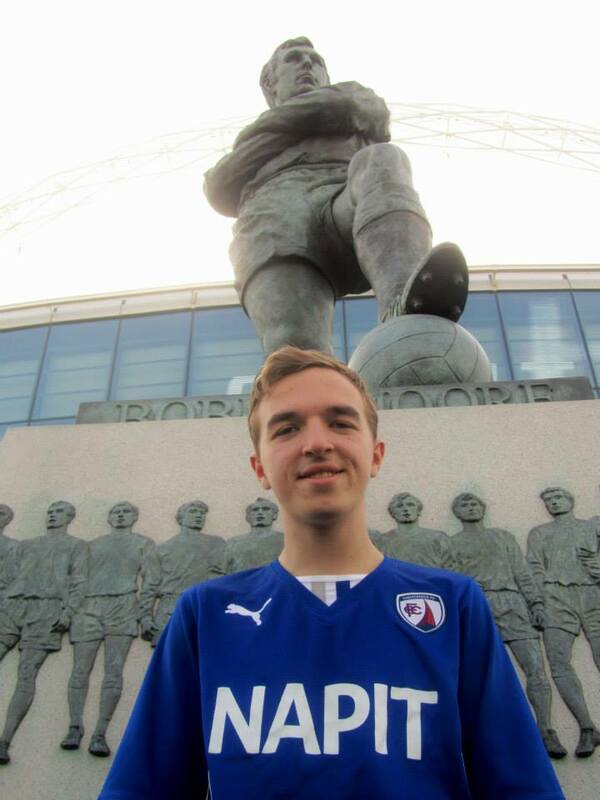 However, the Spireites had the experience of winning the trophy and were sitting nicely in the automatic promotion places in League 2 so they were going to be no pushovers. 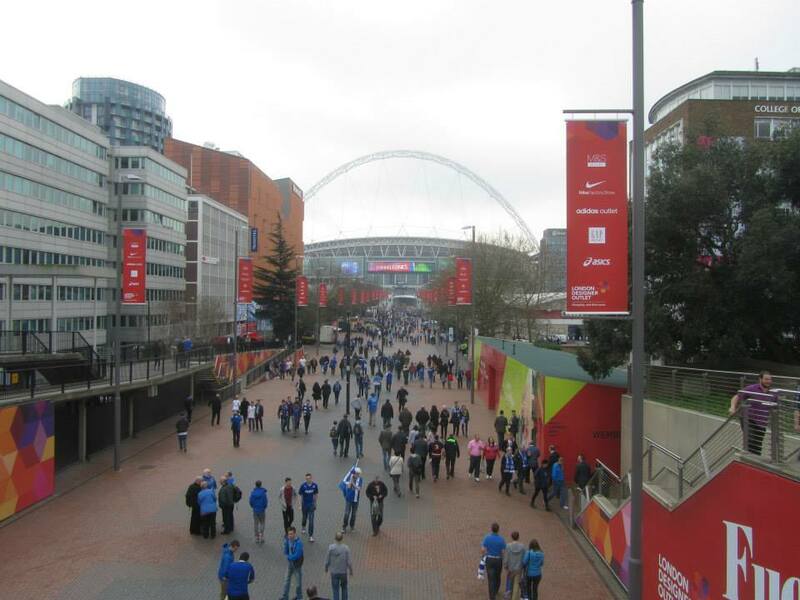 We set off to London early and arrived in plenty of time. 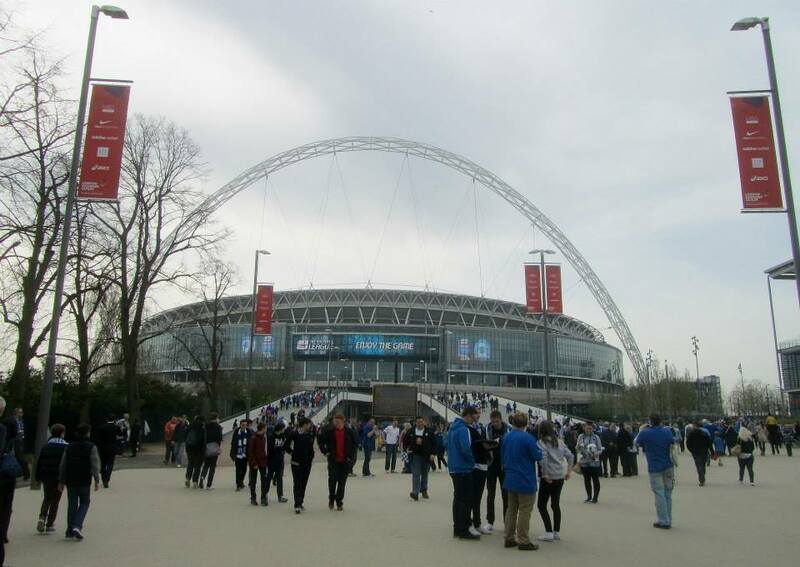 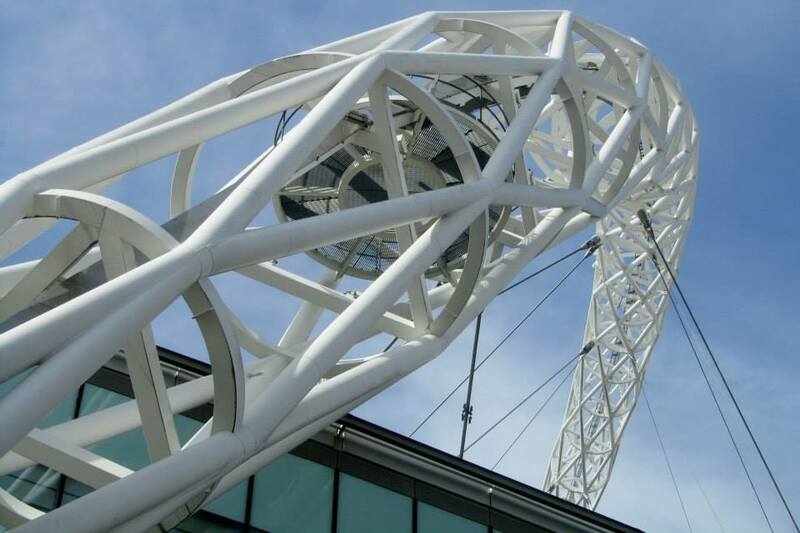 Following a short tube ride from Stanmore to Wembley Park, we stepped out of the station and were greeted by one of the best sights in football, Wembley Way. 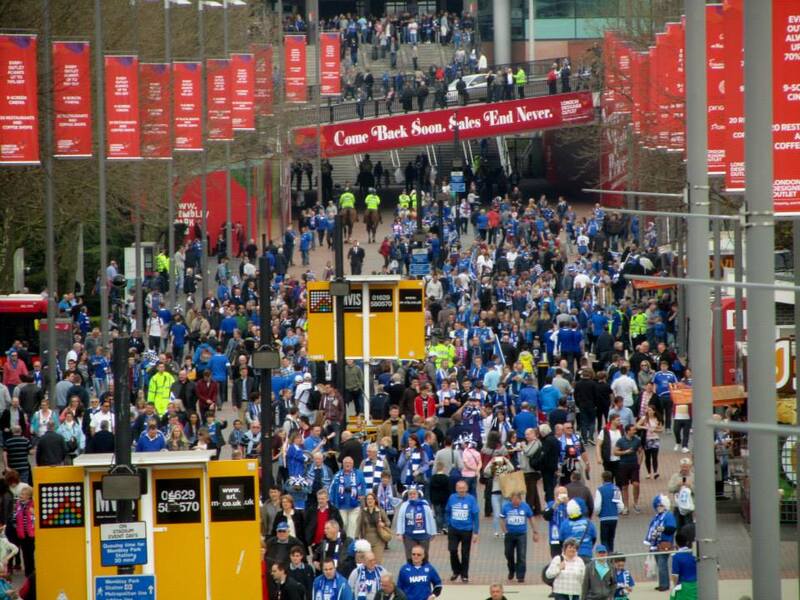 The atmosphere on the way up to the stadium was electric with fans of both teams were proudly wearing their colours, singing and getting hugely excited for the final. 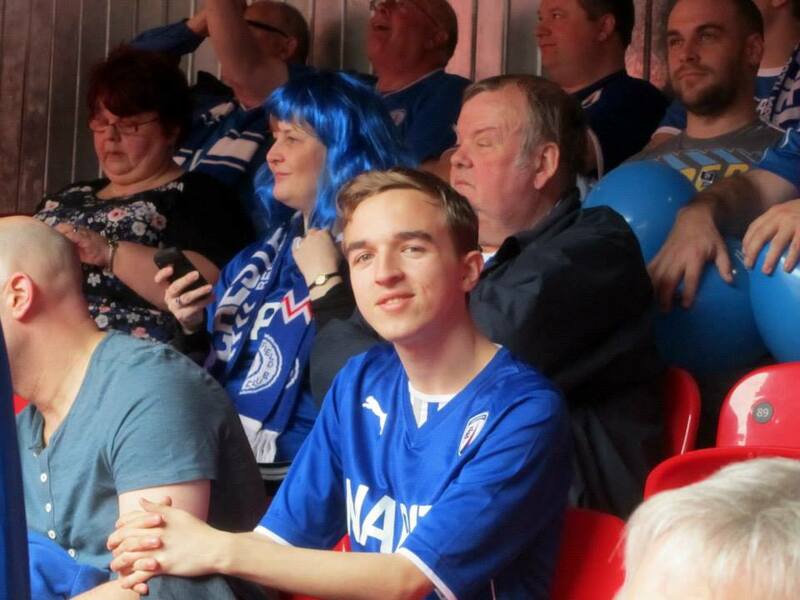 With around half an hour to go until kick off, we made our way through the turnstiles and took our seats amongst the Chesterfield supporters. 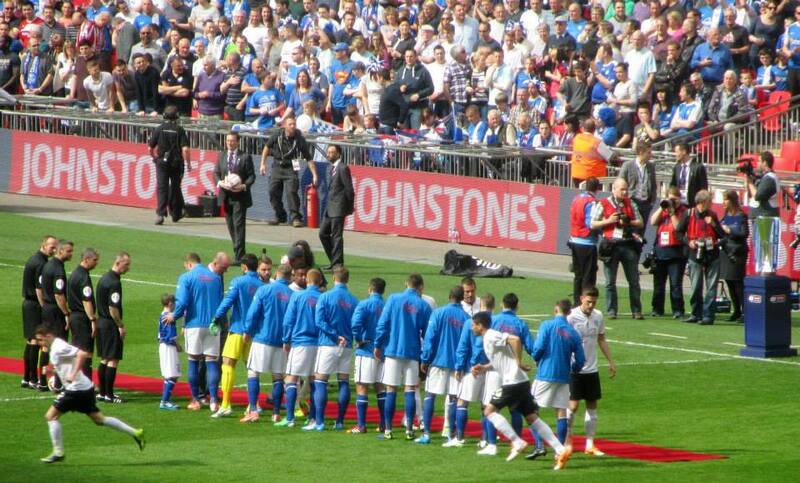 It was a beautiful day and you could feel the anticipation building as kick off time approached. 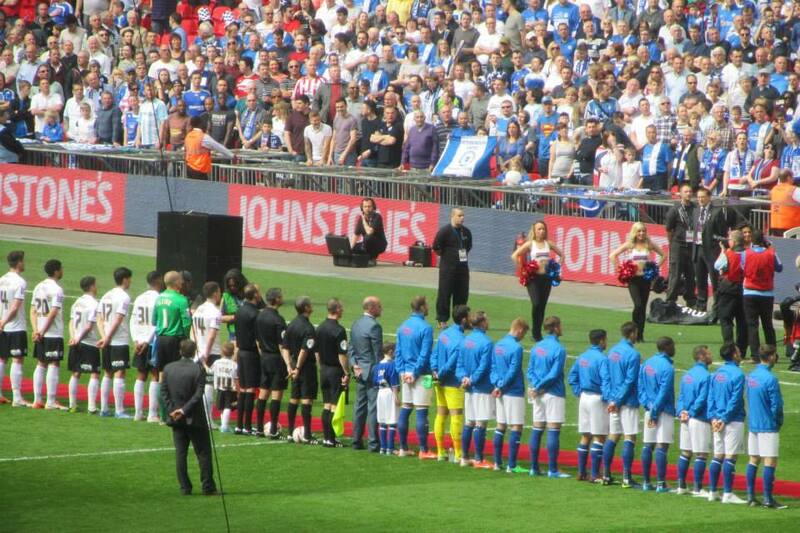 Finally the players made their way on to the pitch, greeted by huge cheers from the supporters and following the national anthem was sung, the game got underway. 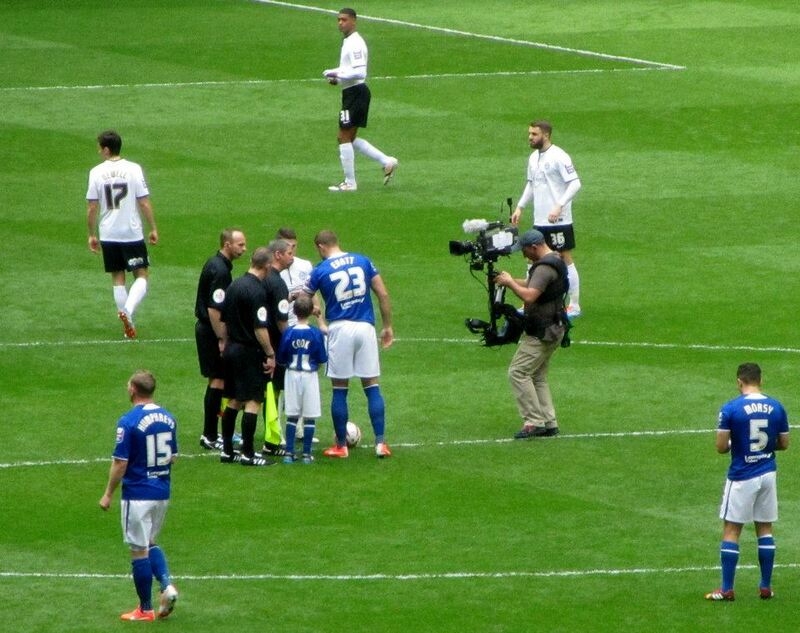 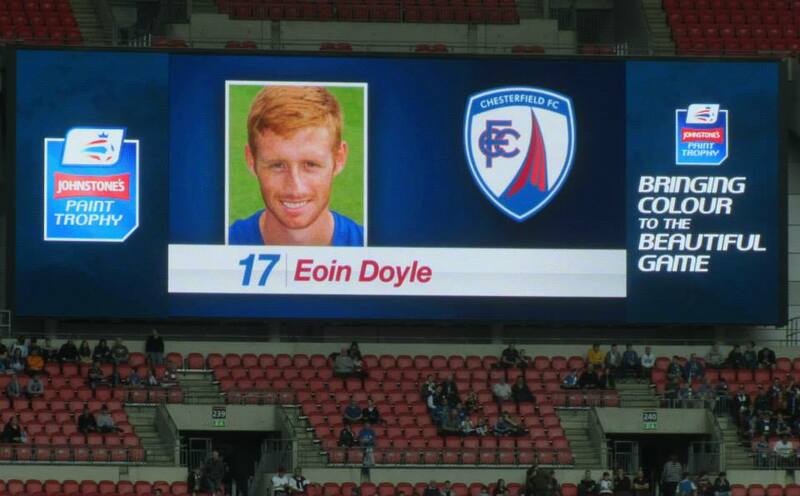 Chesterfield were involved in the first incident of the game when Eoin Doyle was sliced down in the area by Shaun Brisley, but the appeals were waved away by the referee. 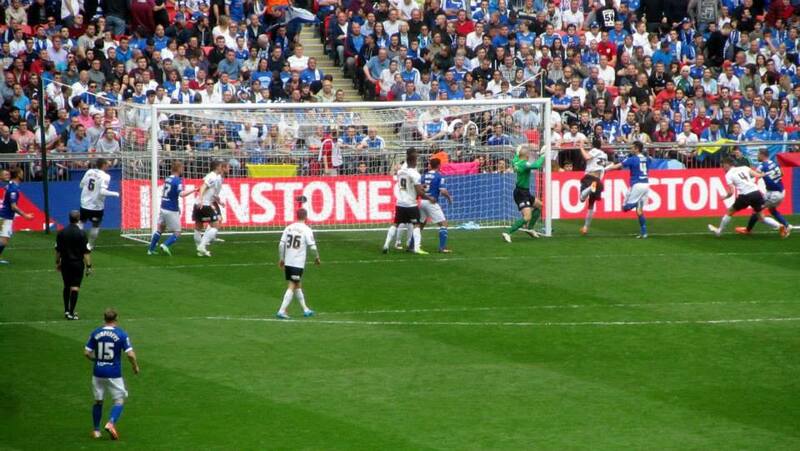 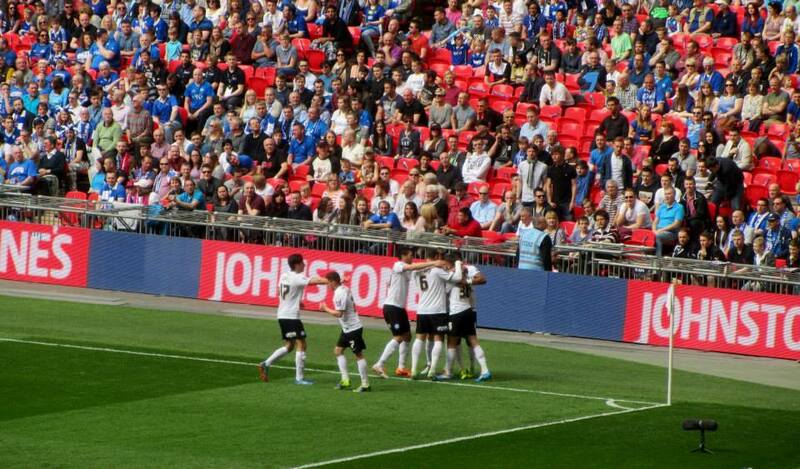 At the other end, Peterborough’s first opportunity of the contest saw them open the scoring. 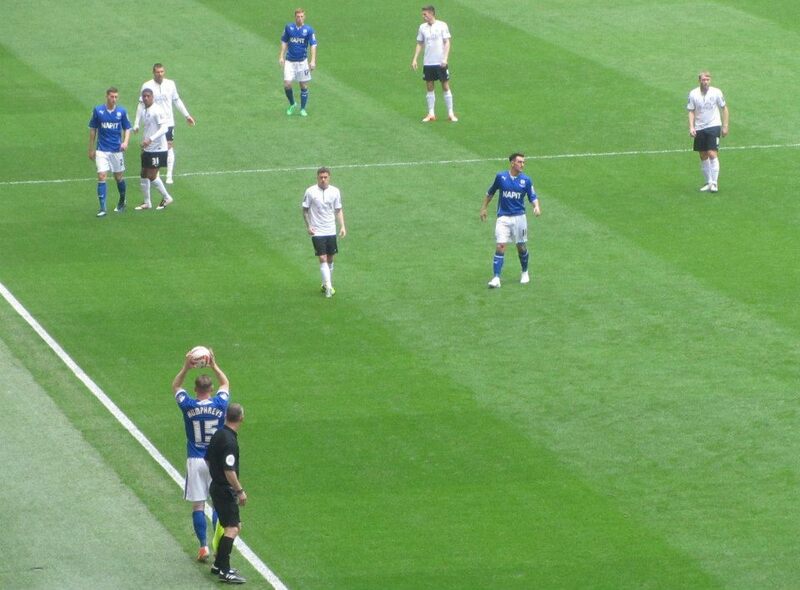 With Spireites captain Ian Evatt temporarily absent from the field due to a cut, Posh took full advantage of the extra man from a corner. 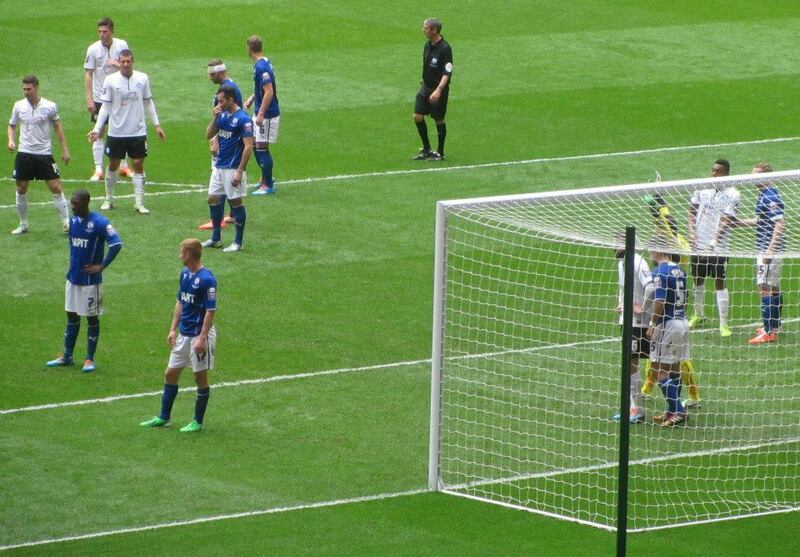 Michael Bostwick’s header was parried by Tommy Lee but the ball fell straight to McQuoid who poked the ball home. 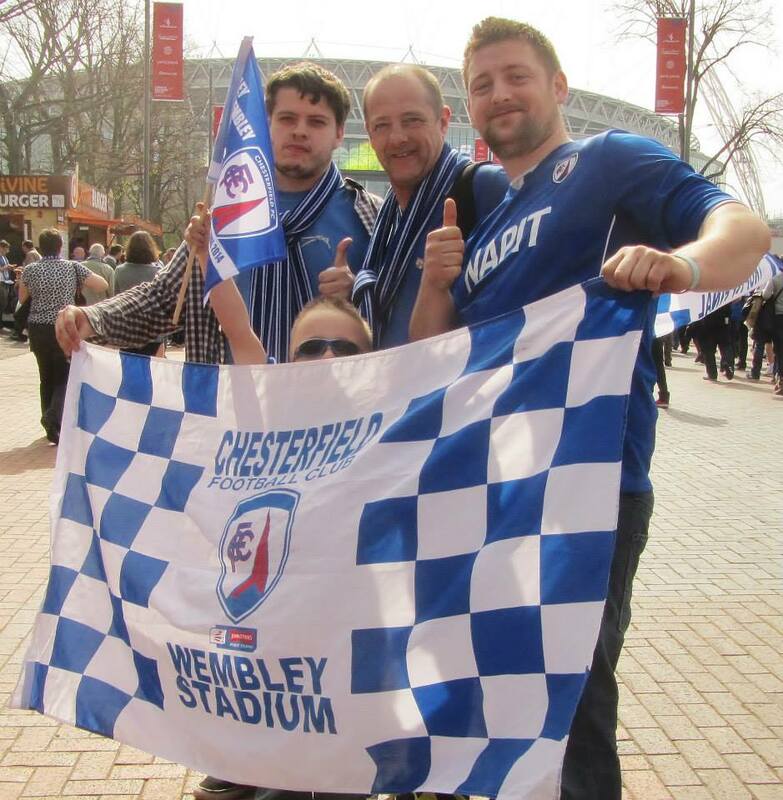 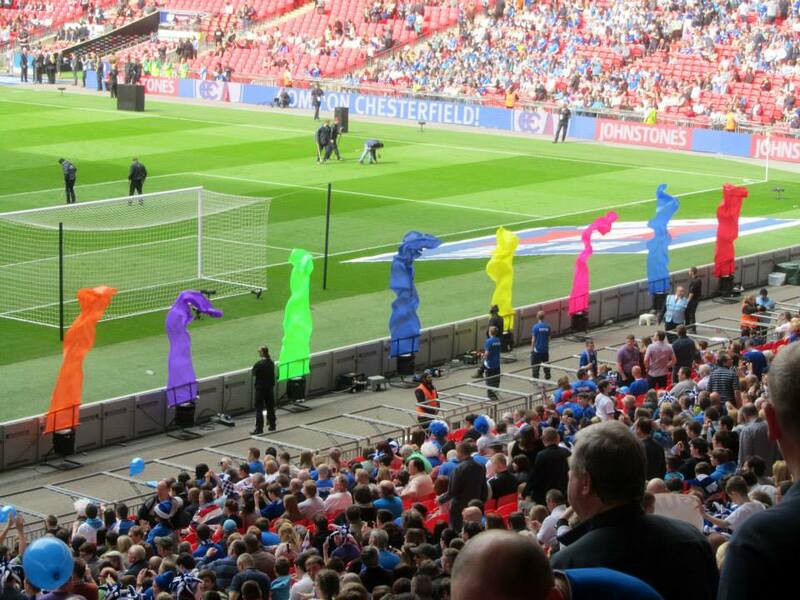 The Chesterfield support was understandably flattened by this early blow. 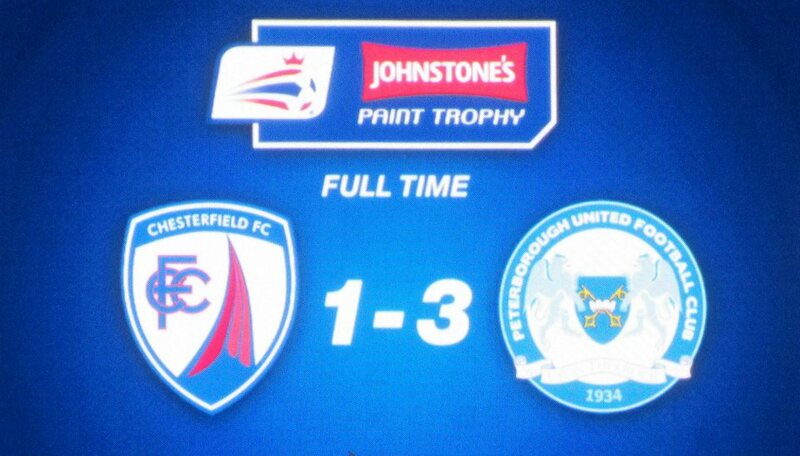 However, the Spireites remained bright and gave their fans reasons to be hopeful as they went close to levelling on a couple of occasions. 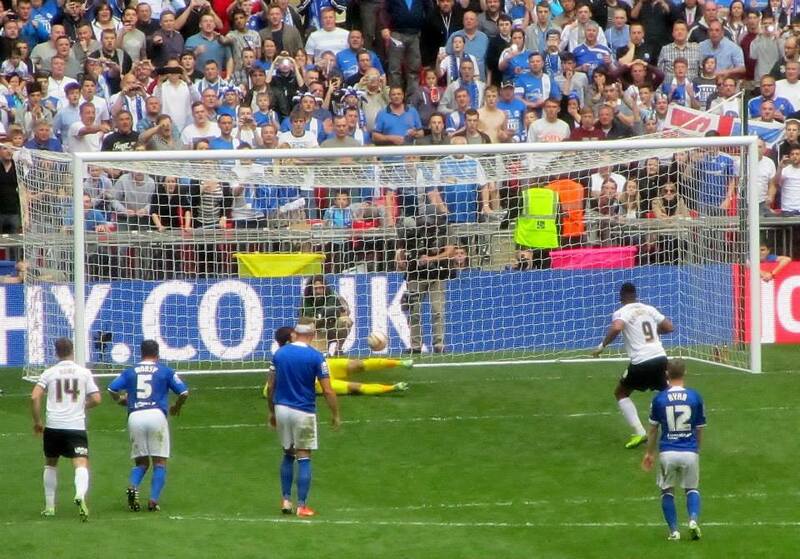 Sam Hird, who replaced the injured Ollie Banks after just 12 minutes, saw his header deflected wide before Doyle fired a shot off target. 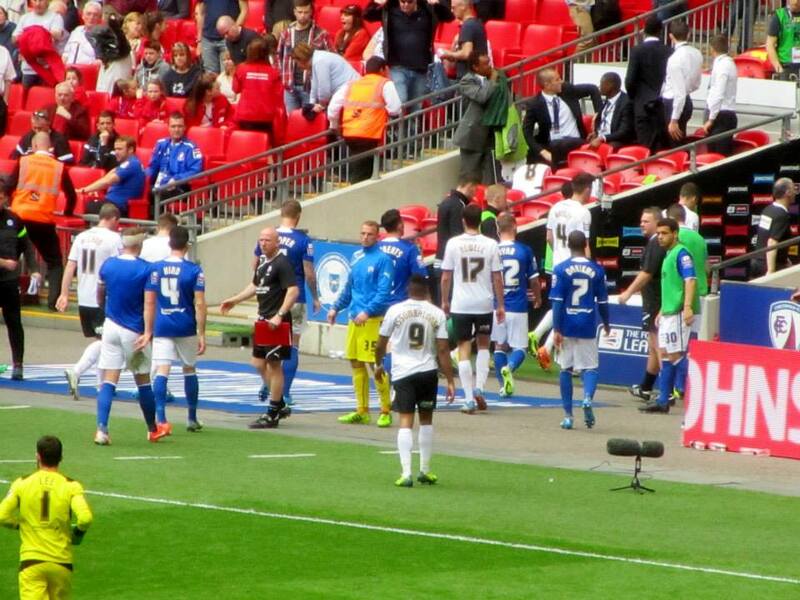 Sam Morsy and Evatt had the two best chances of the game so far for the Northern side but failed to take advantage. 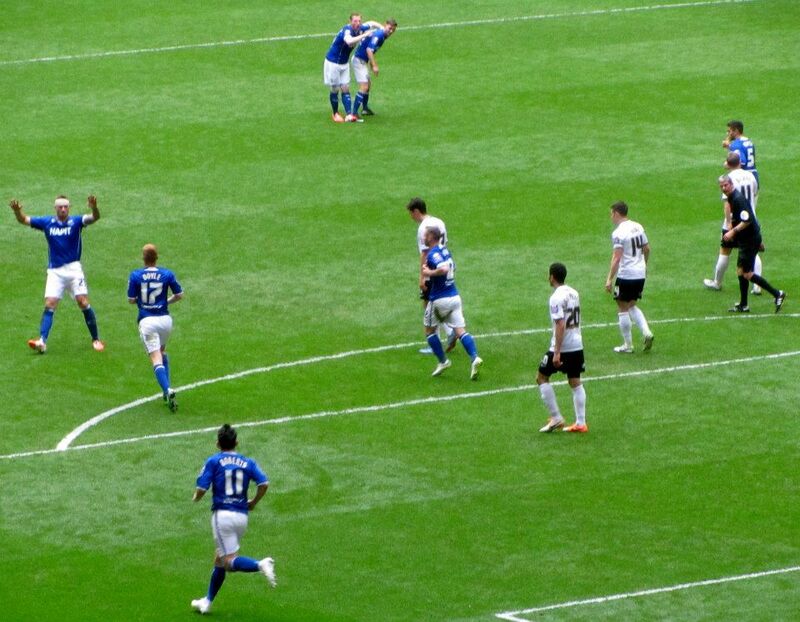 Morsy somehow sliced an effort off target from close range before Evatt’s free header fell harmlessly in to the arms of Peterborough goalkeeper Robert Olejnik. 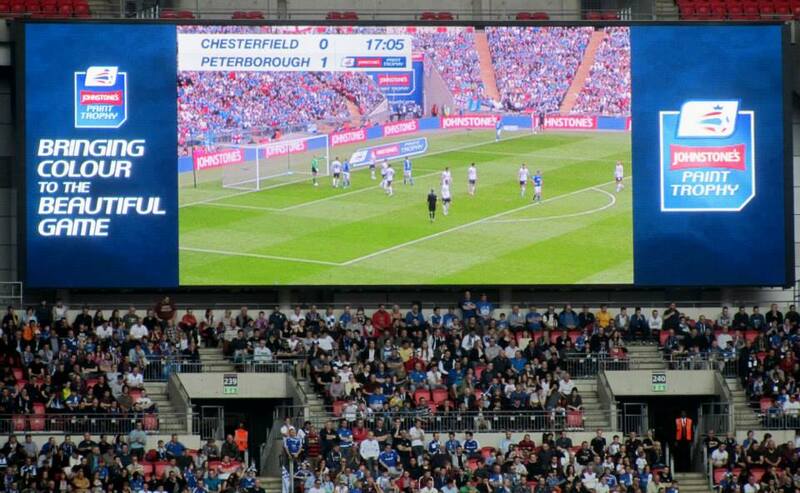 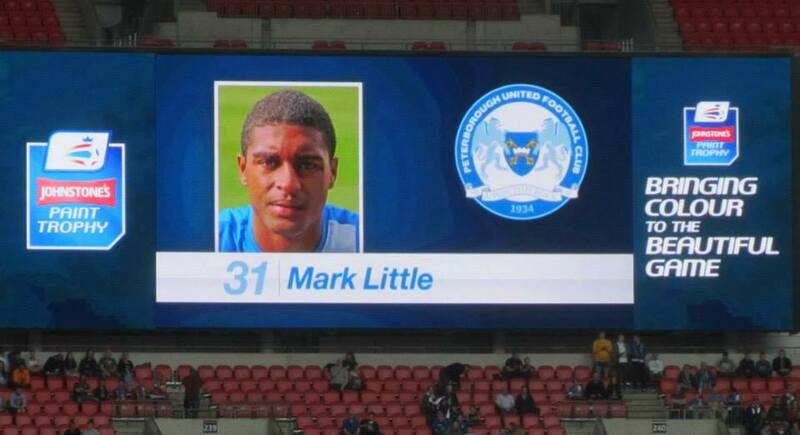 And with seven minutes to go until half time, Posh made the Spireites pay for these missed opportunities. 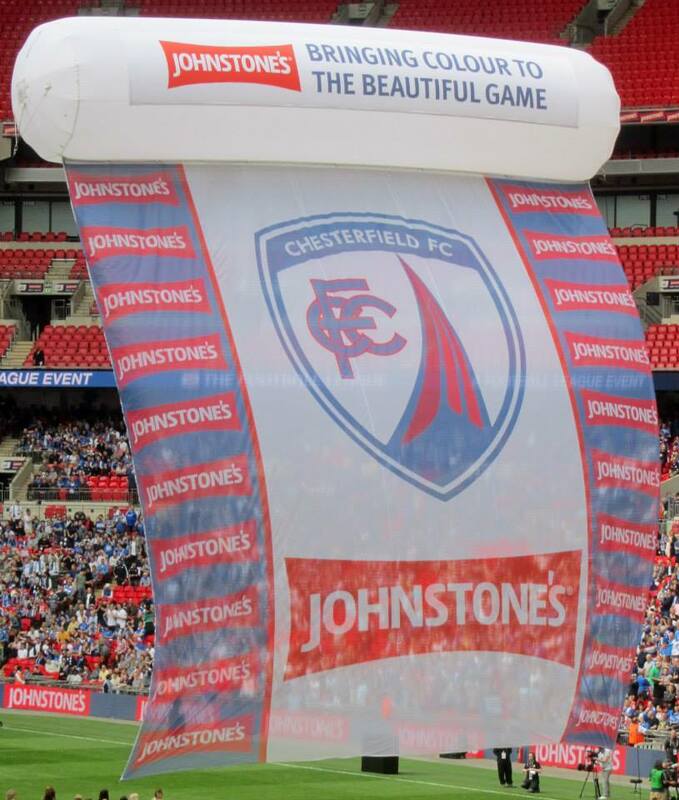 Some poor marking from the Chesterfield defence left Brisley free in the box and the defender powered a header past the goalkeeper to double the League 1 side’s lead. 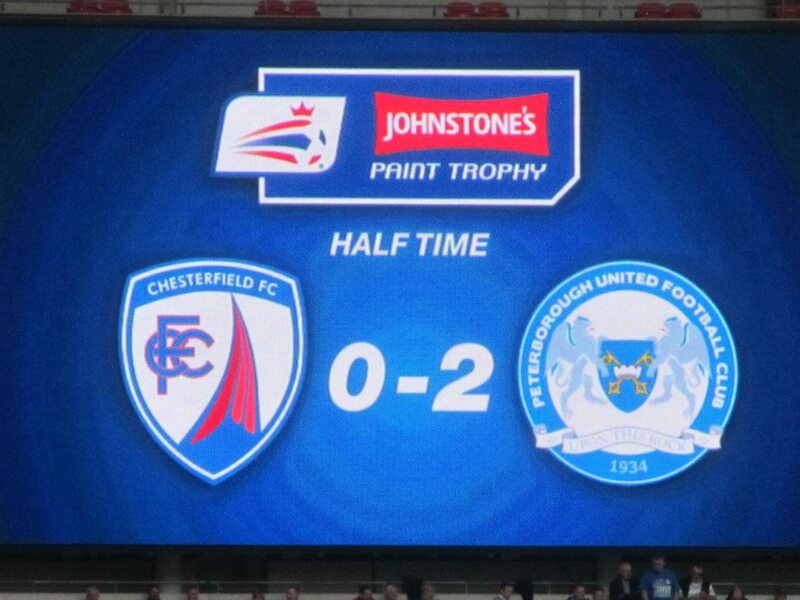 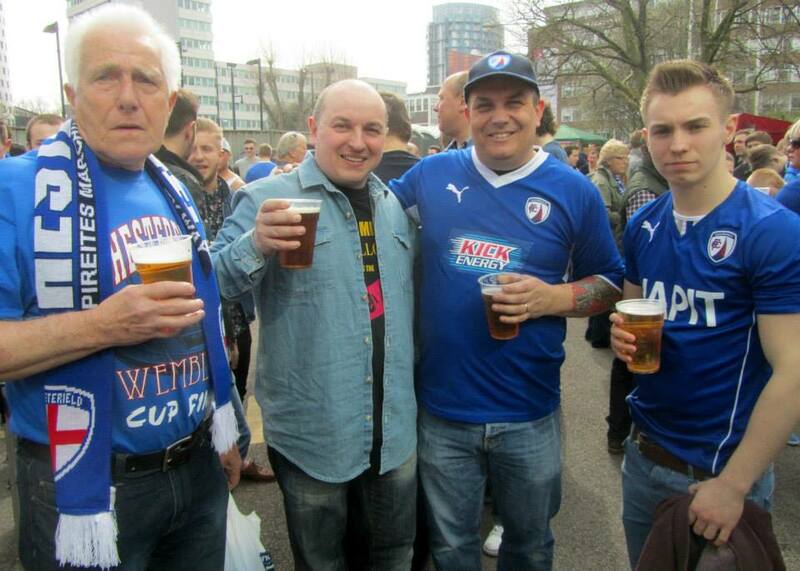 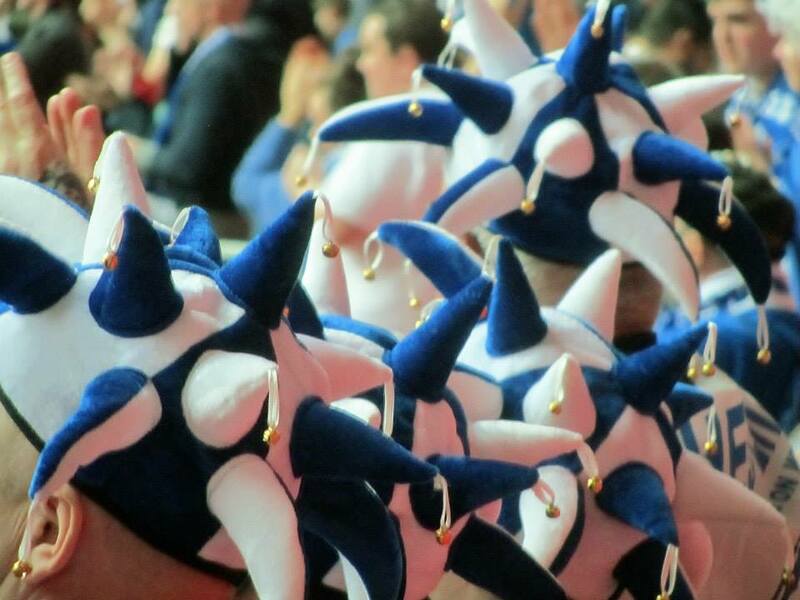 Chesterfield were by far the more positive side at the start of the second period. 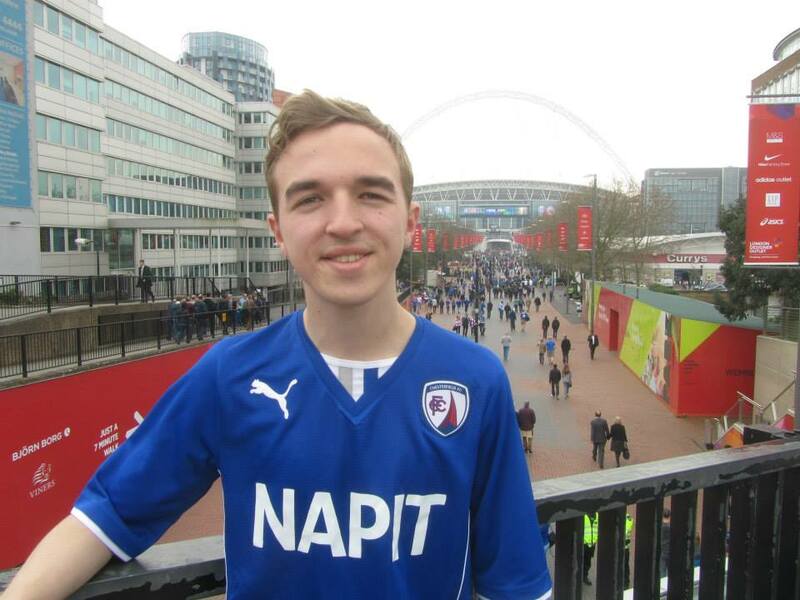 Eight minutes in, the Spireites pulled a goal back courtesy of Doyle. 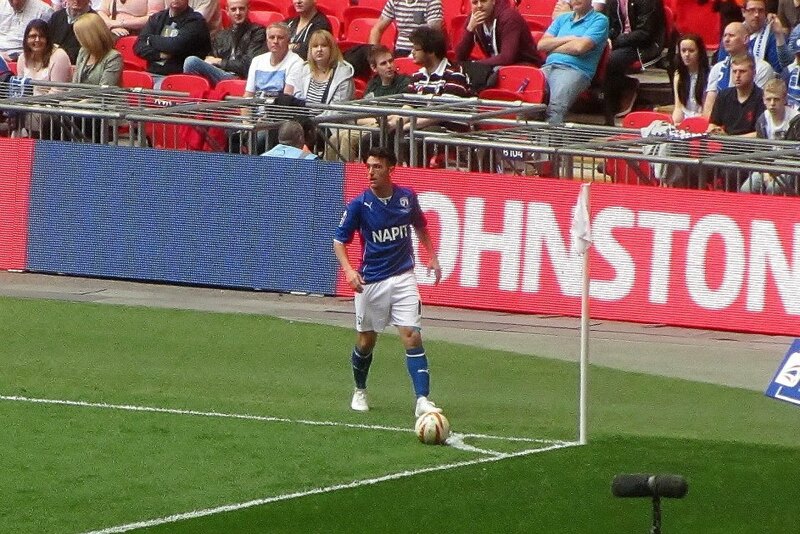 Morsy went on a mazy run before cutting the ball back to the Irishman, whose close range effort flew past Olejnik to reduce the deficit to just one goal. 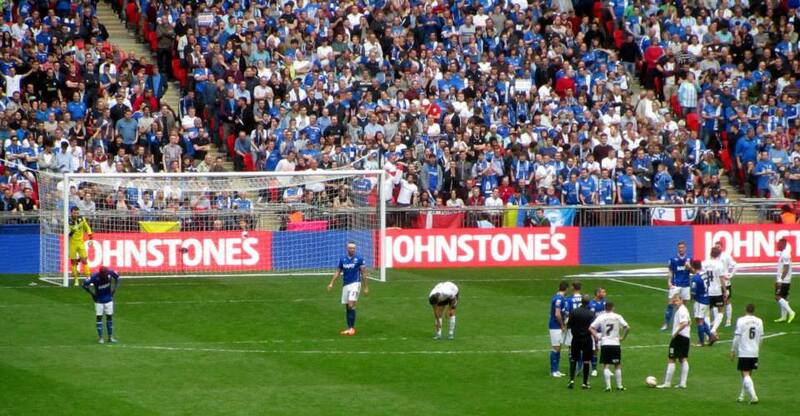 The Spireites continued to pile on the pressure. 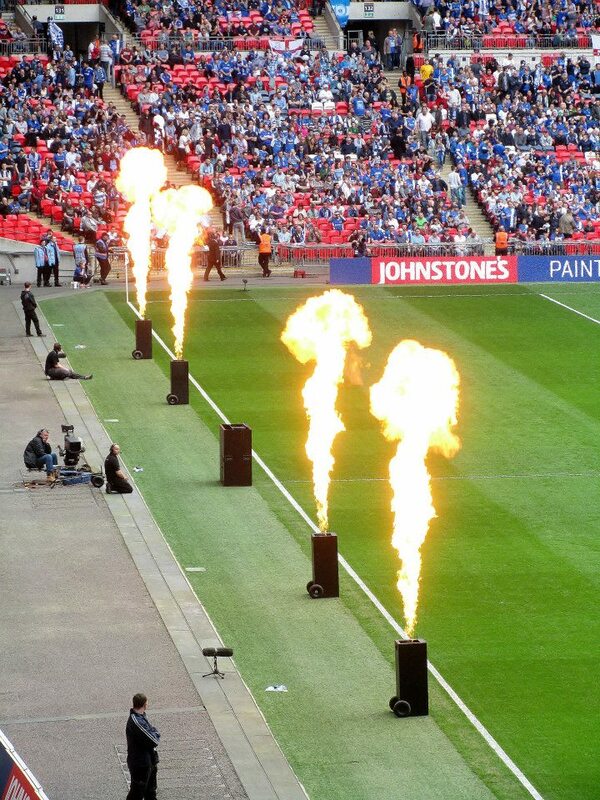 Their hopes were given a major boost with a little over 20 minutes to go when Joe Newell was sent off for a kick out on Morsy. 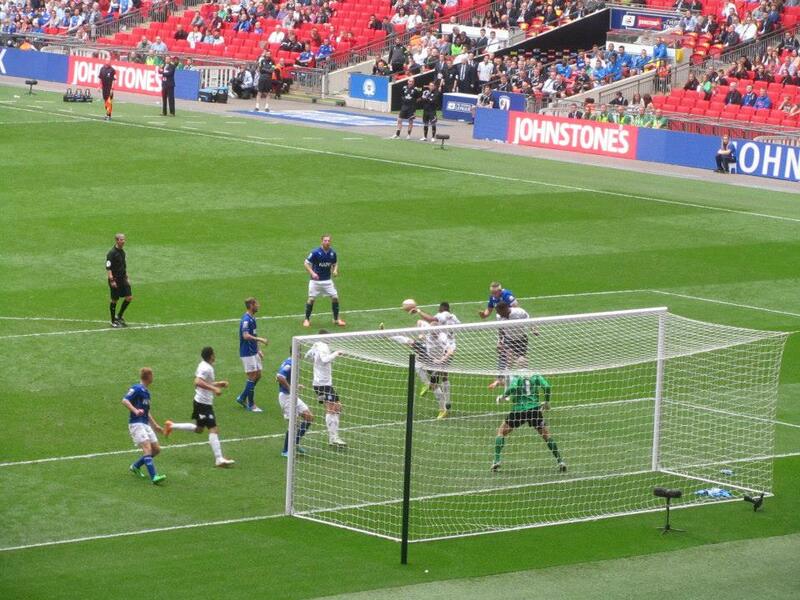 However, in the 77th minute the result looked to have been put beyond doubt. 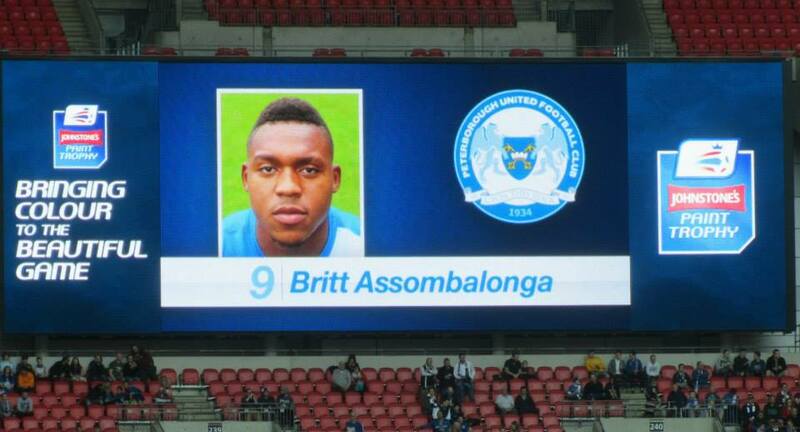 Liam Cooper brought down ex-Spireite Mark Little in the box and the referee pointed to the spot, Posh’s Britt Assombalonga firing home to make it 3-1. 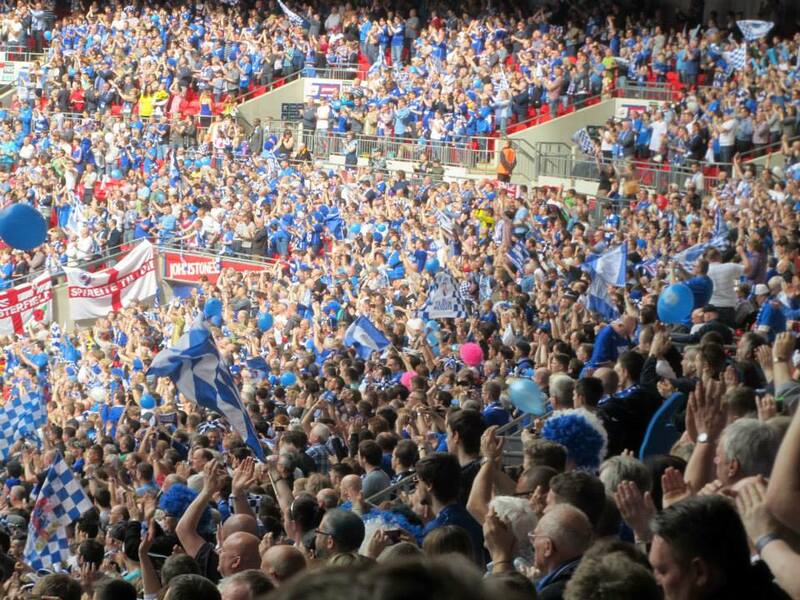 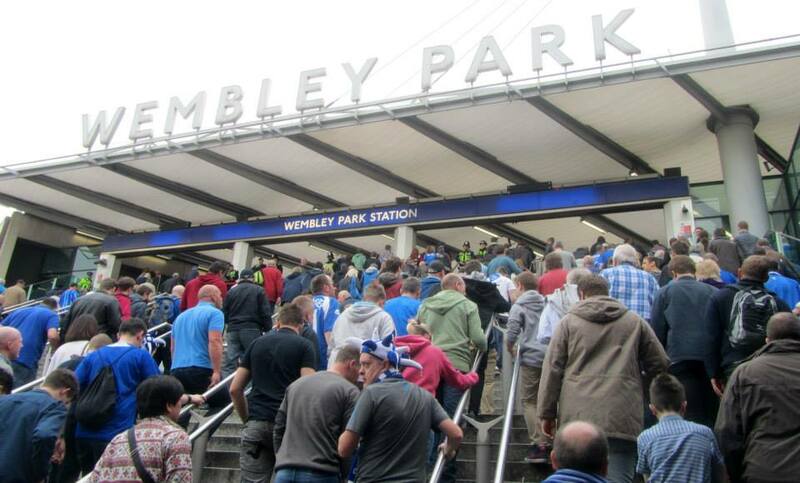 The Spireites continued to battle to the bitter end but it wasn’t enough and as the full time whistle blow, there was a huge cheer from the Peterborough fans as their side climbed up the famous Wembley steps to lift the trophy for the first time. 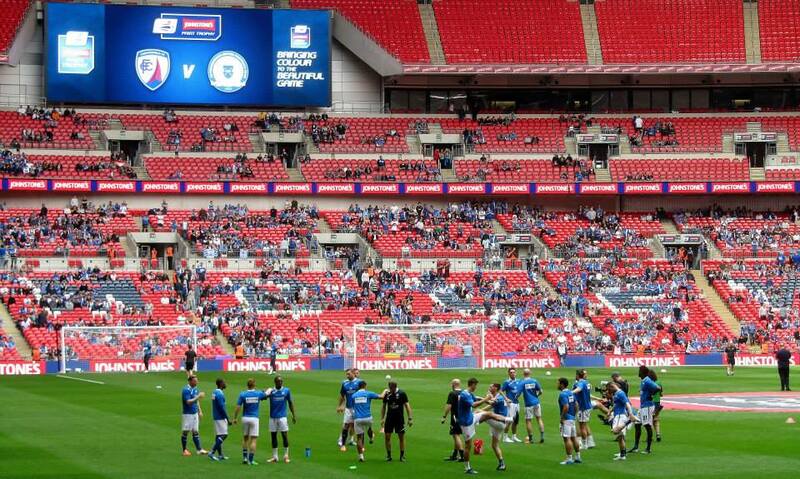 It was obviously disappointing to come away from Wembley a loser with Chesterfield’s lack of clinicality in front of goal being the major difference between the sides. 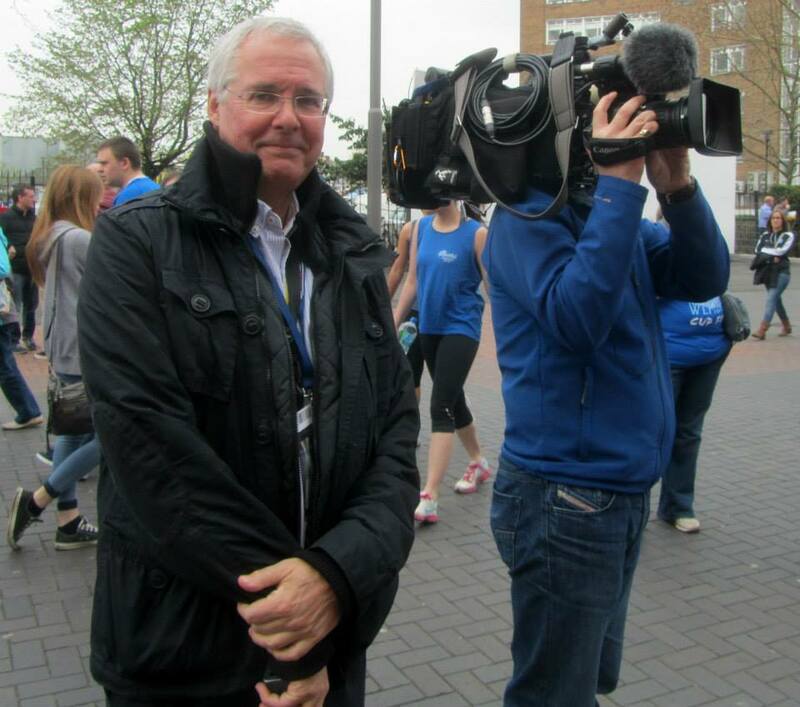 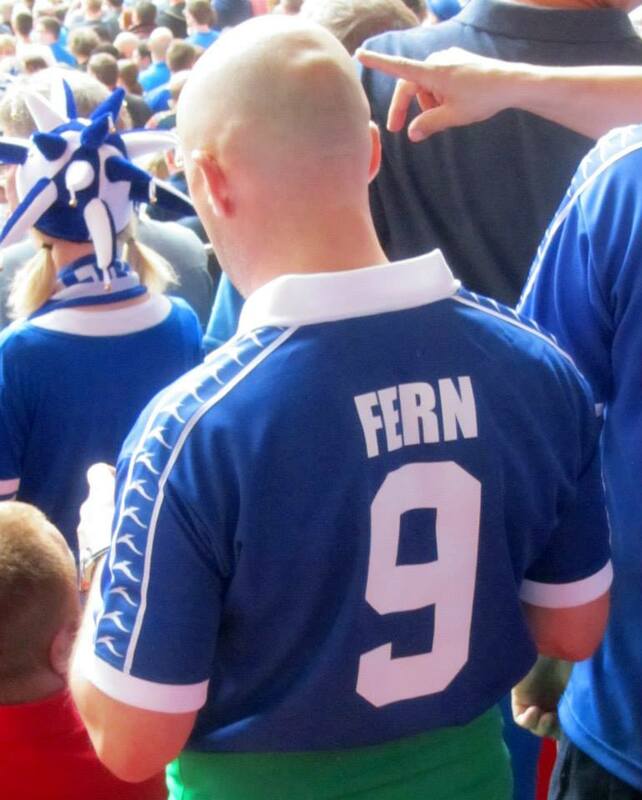 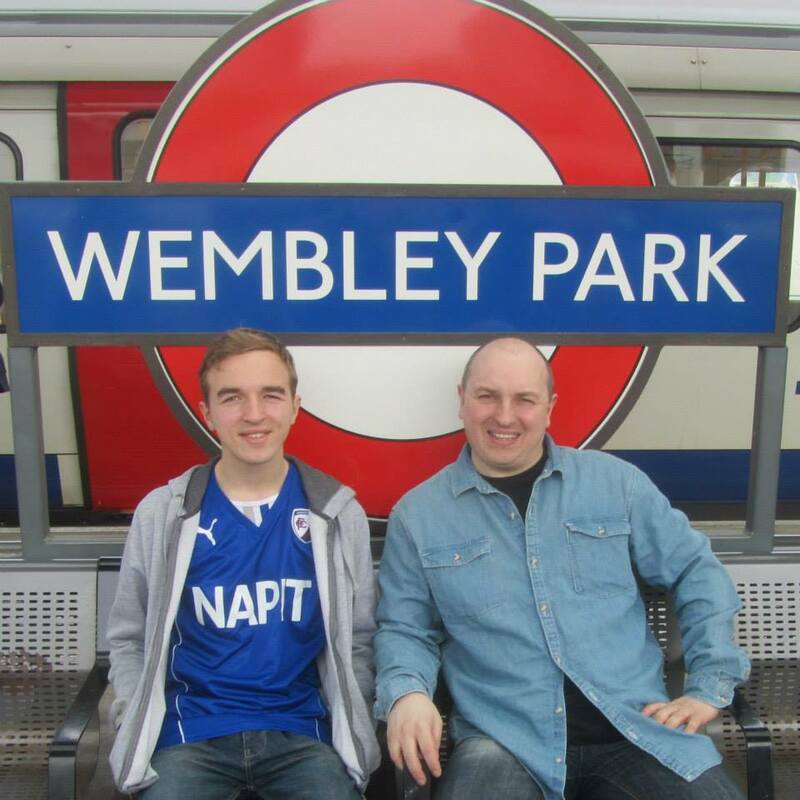 The result alone meant that this day would not be as fondly remembered as my first trip to the national stadium two years ago. 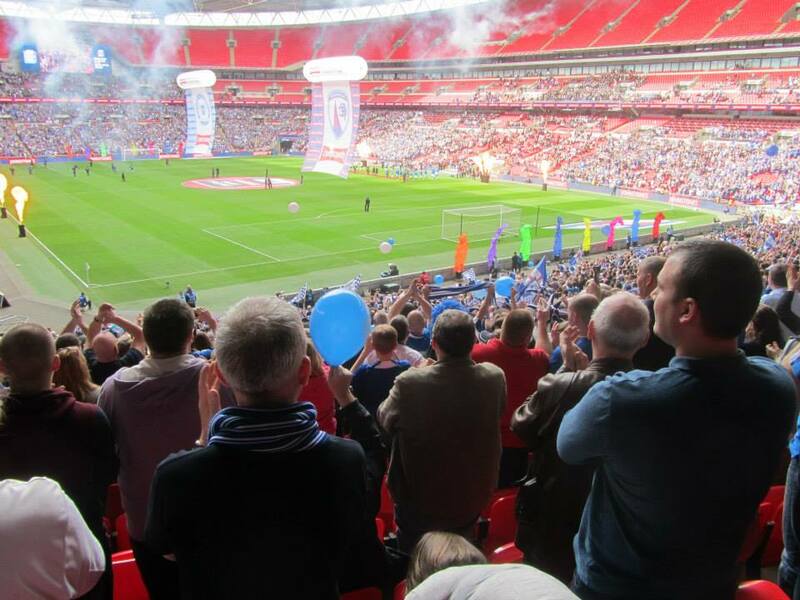 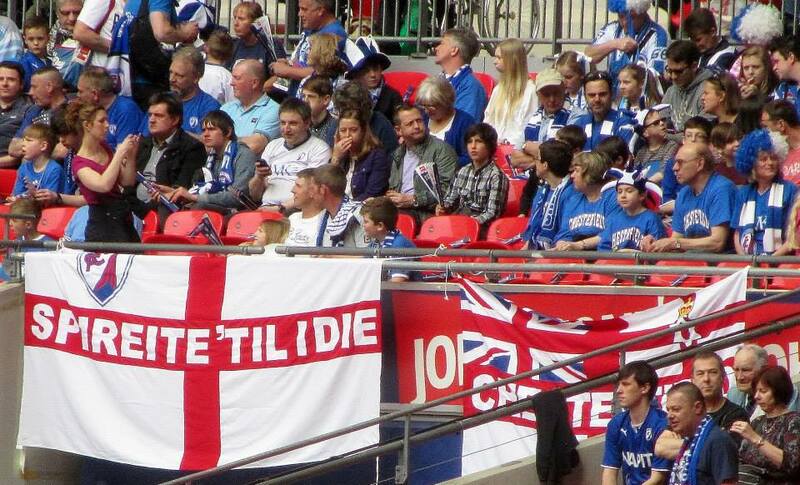 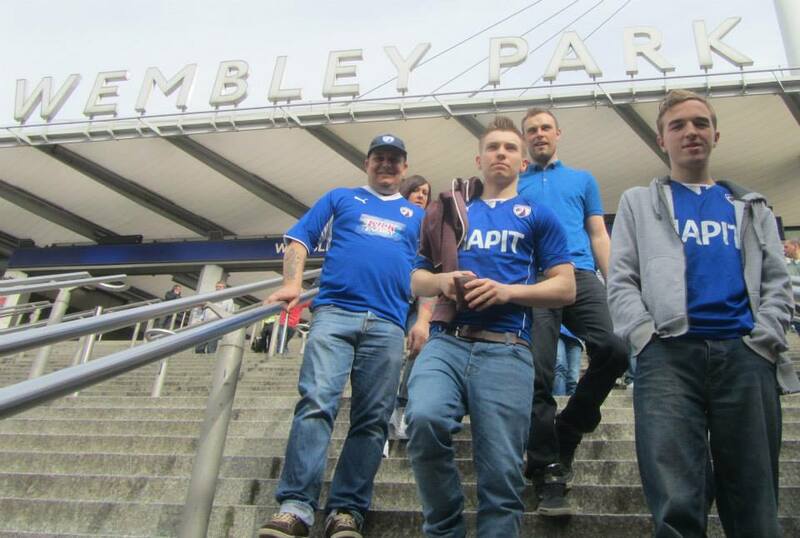 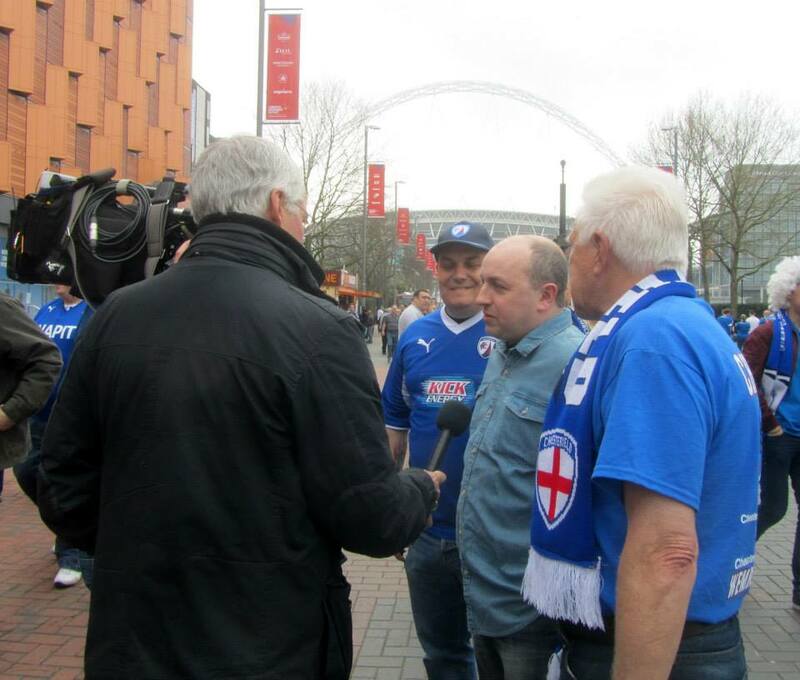 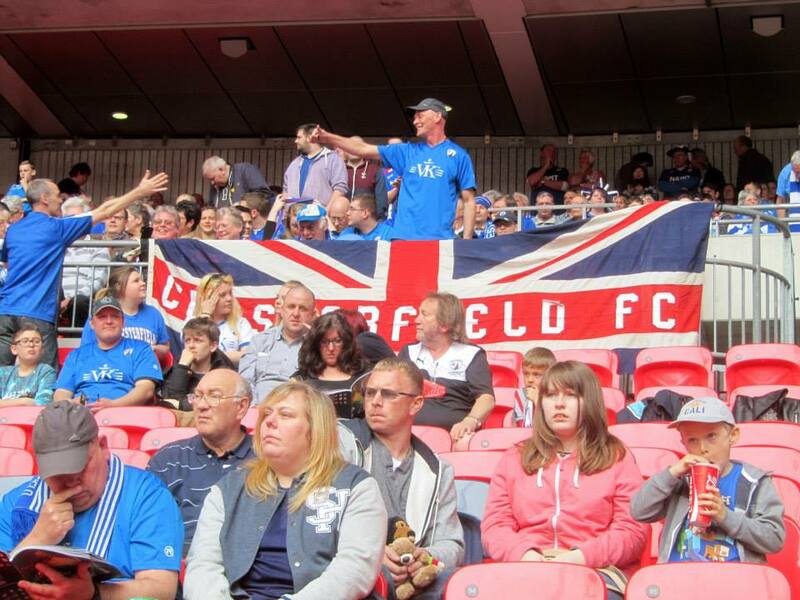 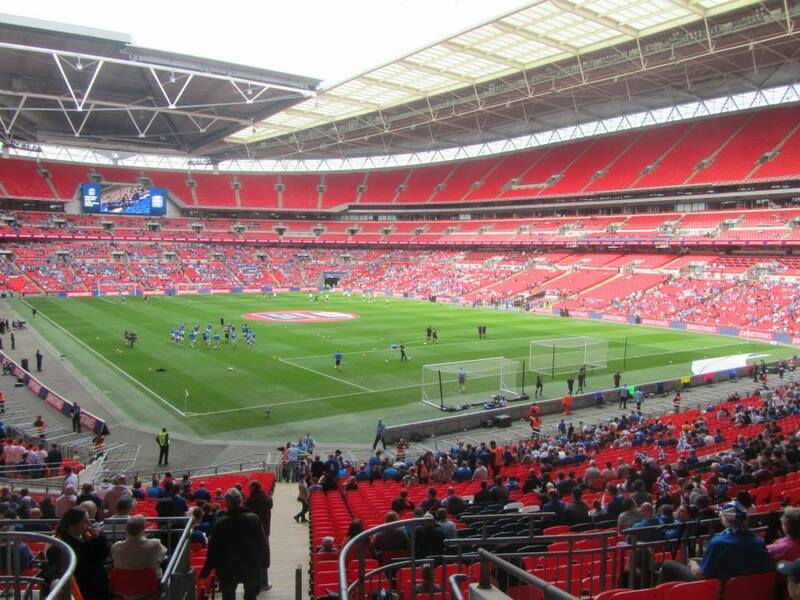 However, any trip to Wembley is still enjoyable and defeat in this game will not be a long-term disappointment as long as the Spireites can gain promotion to League 1 at the end of this season. 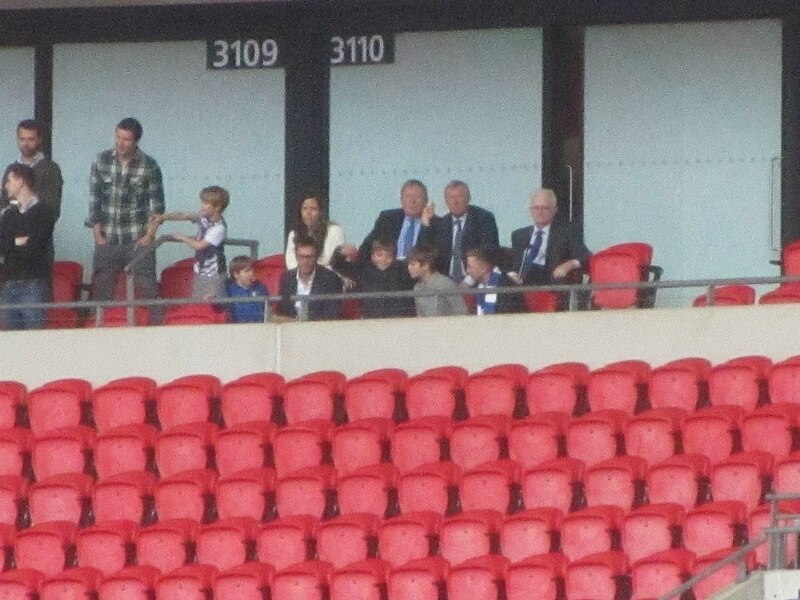 Sir Alex Ferguson watches the Spireites!